Most agencies will stress the importance of a strong marketing strategy and solid communications plan. They’ll talk about target markets, unique selling points and key audiences…and then probably sell you a new website and Twitter account management! Here at Whale, we like to do things a little differently. Or you could say, a little more ‘wholeheartedly’…Here is our four step guide to marketing strategy development. At the heart of any good marketing strategy is a thorough understanding of a business’ strategy and long term plans. This is always the first place we start with a client; sitting down with the directors of the company to fully get to grips with where it is the business is heading, or hoping to head. We’d like to think that no stone is left unturned during this process; we insist on nothing less that a full SWOT analysis of both internal and external factors affecting the business. Once we feel fully satisfied that we have a complete picture of the business, it’s time to put our ‘marketeer’ heads on and look at what is required to meet the business’ needs. Before getting into the nitty gritty of marketing activities, we work with clients to set tangible, realistic and measurable goals. It’s important to point out that end goals for a business are not always the obvious ‘generating enquiries’ or ‘building brand’. 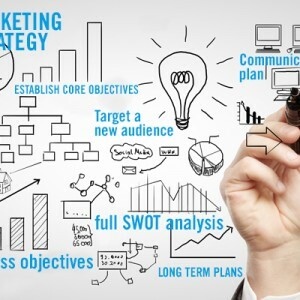 Quite often, once the business objectives have been drilled down, it can transpire that the initial objective for a marketing campaign is something a little less expected, such as changing the perception of the brand or targeting a new audience; as it is these types of activities that may be critical to generating the right kind of leads for new business. Whatever the goals(s), keeping them SMART goals (specific, measurable, achievable, results-focused, and time- bound) ensures that both clients and ourselves have something clear to hang a hat on and come back to later in the campaign. Then and only then, it’s time to develop a marketing plan around it. Before doing anything new, it’s imperative to ensure the basics are right. Is the branding up to date and is the messaging clear? Is everything consistent across marketing materials / platforms or are there anomalies? Creating a solid groundwork is essential for building anything; and that includes a communications plan! Once the marketing strategy / comms plan has started being implemented, it’s all systems go! Devising a timeline for activities, getting the right team in place and going at it with gusto is the ‘fun bit’ in any marketing campaign. However, any communications plan should link back to the established core objectives and it’s vital that this doesn’t go MIA. This is something we are passionate about here at Whale – we believe all marketing activity and spend should be accountable, and referring back to the goals set at the beginning of a campaign and measuring ourselves against them, is what drives us to keep on delivering results for clients! Here at Whale, we don’t just pay lip service to marketing strategy. We know from the years of working with our loyal clients that time spent developing, implementing and seeing through a marketing strategy really does deliver on business goals. To speak to us about marketing strategy and communications planning to help your business achieve its objectives, get in touch!